Our head lice Specialist are kind, caring, compassionate and gentle. We take our time and completely eradicate each individual case of head lice. Our Specialist are well educated and ready and willing to share information, tips and "How To" instructions on getting rid of lice for good. All of our head checks are performed by our highly trained and experienced Specialists. Each individual receives a full head check making sure to inspect the entire head. If any head lice or nits are found, our specialist will show the client, parent, guardian or spouse what they have found. This also helps with any uncertainties in the future. We use natural pesticide-free enzyme that aids us in removing head lice and nits. 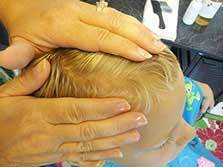 Each treatment receives a thorough comb out, removing all nits and lice from the hair. Our Specialists have a successful technique when it comes to combing and eliminating nits and head lice. After each head lice comb out we follow behind by soaking the hair with a special oil that will kill any lice that may have eluded the comb out process. We also recommend anyone that has been exposed to a person with lice to get a oil treatment to prevent any further infestation. After the head lice treatment, each person is sent home with a set of instructions on how to clean their home and how to prevent getting head lice in the future. Each person that received treatment will be scheduled to come back to the salon for a follow up appointment. This appointment will take place 3-5 days after the initial appointment but no more then 6 days. 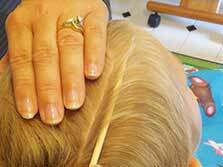 We offer a Head Lice Policy designed for Daycares. We have different options that work well with the Parents and the Daycare specifically. The Head Lice Policy that is agreed upon with Jamie’s Lice Angels is implemented right into the contract between Parents and Daycare. We work with local camps and have programs available. We travel to the camp location and perform head lice checks and head lice treatments at group rates. Please call for more info.